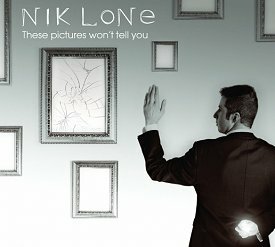 It’s not often that the phrase mind blowing can be used justifiably but Nik Lone’s debut album is one instance where other descriptions just don’t quite suffice. From the very first seconds of play the music is hauntingly melancholy and incredibly beautiful. I can imagine Lone doing live performances to crowd with tear tracks weaving down their cheeks. That’s how much of an emotional impact Lone’s compositions make. It’s unbelievable that Lone never had formal musical training and instead taught himself to sing, creating unique acappellla songs during his teen years. After pursuing a career in science, Lone start to really develop his music in the mid 2000s, backed by short lived band Goodnight Thomas. In 2006 Lone released the EP Close, spawning more frequent performances, festival appearances and a US tour. After his return, Lone put the band on hiatus, focusing on writing his solo album These Pictures Won’t Tell and with marvellous results. With poignant vocals, immaculate classical strings and more modern synth touches, the album is a beautiful, emotional journey which is at times, breath taking. Songs occasionally lack distinguishing features, but on the whole it’s a touching collection. The album starts off with “Raining”, a breathtaking ballad with ethereal piano and vocals to send a frisson up your spine. This is purely emotive music dripping with plaintive lyrical depth. Never have I heard the words “It’s raining” sound so simultaneously beautiful and sad. “By Your Side” leads in with legato piano and crisp vocals, gradually building to include strings and more forceful vocal tones. Lead single “We’re Dying Alone” is dreamy, plaintive and utterly gorgeous with an almost Beatles-esque feel. The song teams firm piano and lush strings with Lone’s vocals frequently going from hushed to soaring with fluid melody. “Time” sees Lone’s vocals at their most husky and melancholy while the string arrangement continues to swoop around his pained lyrics. “The Winter Song” features lilting vocals, flowing strings, rhythmic drums and a much stronger tone than many of the album’s quieter pieces. The instrumentals swoop and soar with clear vocals lighting up the track. “The Love Inside” is all halting strings and creeping synth with Lone’s crisp, high vocals layered on top to create an eerie dreamscape of a tune. The beauty about this album is that it has the ability to truly be judged on its own merit. The Melbourne singer songwriter doesn’t need to be described as “the new insert-artist-name-here”. His style and voice is so clearly his own and so incredibly poignant that half-hearted comparisons are rendered useless and unnecessary. Forgive me if my prose is getting a tad purple, but believe me when I say that Lone deserves it.